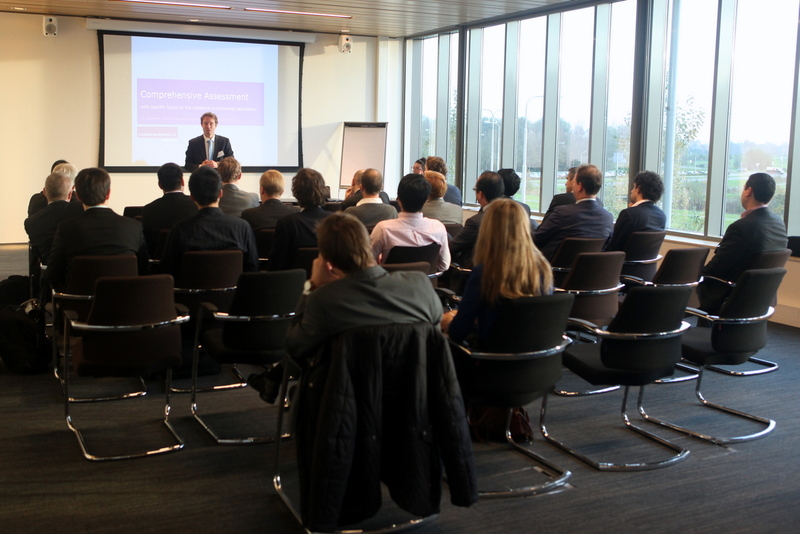 The 2014 TopQuants Autumn Event was recently held at the global headquarters of KPMG in Amstelveen. For the first time since 2011, TopQuants witnessed a complete ticket sellout within 24 hours following the event announcement which marks another success story for us!!! 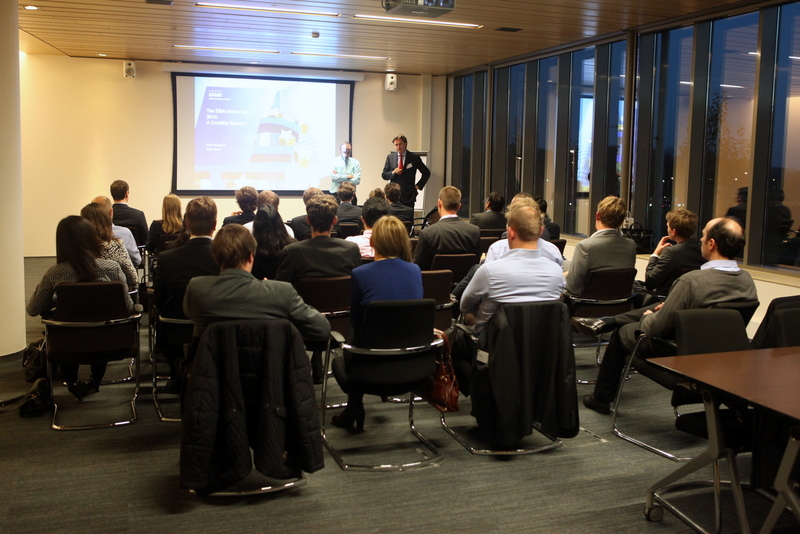 The format of the event was similar to the previous TopQuants Autumn events and had two rounds of five parallel sessions each with a sitting capacity of around 30 people per session. 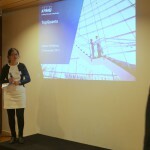 The presentations covered a range of topics that were mainly focused on risk modeling and implementation, big data analysis, valuation of complex financial products and execution of the banking supervisory mechanism in The Netherlands. 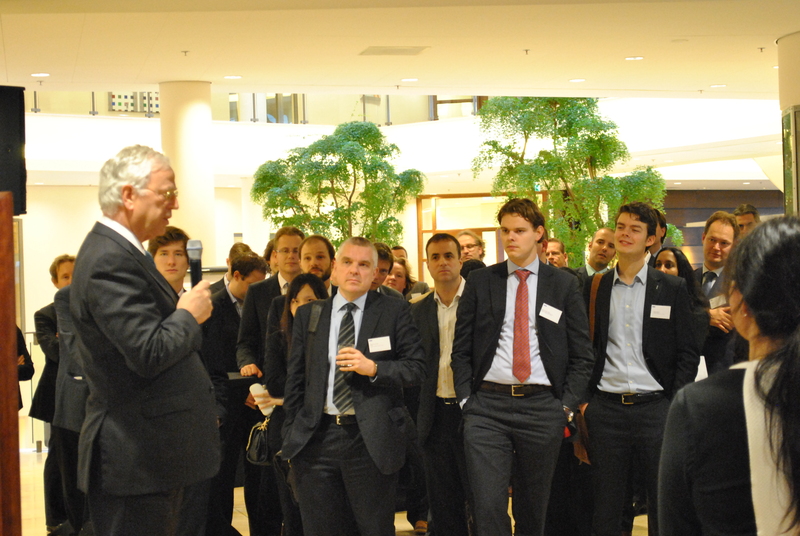 The affiliation of the speakers included banks, audit, insurance and proprietary trading firms. The event started with an introductory speech given by TopQuants committee member, Caroline Tan, in which she outlined the brief history of the organization from 2011 until now. She mentioned that as always, TopQuants is keen to meet quants who want to become active within the organization. 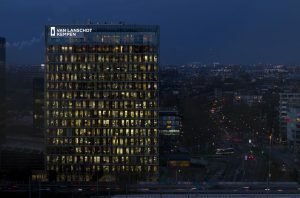 Moreover, in 2015 TopQuants will assume the status of a formal association (Vereniging). This was followed by a warm welcome speech by Jan Hommen, the CEO of KPMG, who expressed his happiness to see such a large Quant audience. 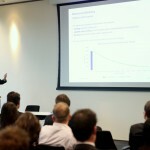 He indicated the potential opportunities that KPMG offers for quants. The presentation from DNB by Francesca Armandillo and Martijn Schrijvers titled Comprehensive assessment – with specific focus on the collective provisioning calculation for RRE – contained highlights of the execution phase of the Asset Quality Review (AQR) and particularly focused on the Collective Provision Analysis Challenger model that was developed by the European Central Bank to validate the banks’ internal credit models used for loan loss provisioning. The Dutch banks performed relatively well in the AQR stress test compared to other EU banks. The challenger model is the same for all banks, although the model will be parameterised based on observed data. 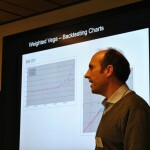 The presentation was interesting and was followed by several questions from the audience. Among the talks on risk modeling, particularly interesting was the presentation by Philippos Papadopoulos (OpenRisk) who emphasized the need for open source risk modeling within the financial community and discussed the implementation aspects of it. He highlighted the importance of peer review and collaborative work when it comes to Risk Management and cited several illustrative examples of open source software (mainly Java based) for finance. He also discussed many implementation challenges like licensing of open source software, protection of client data etc. 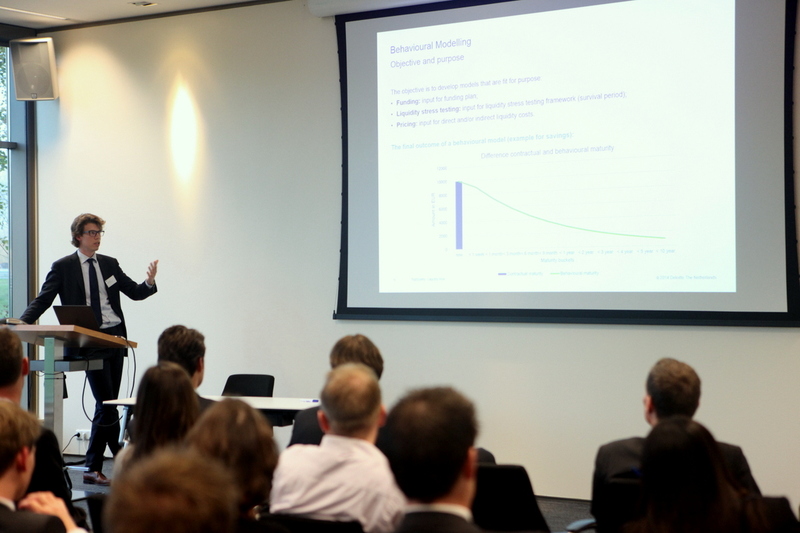 The presentation from Deloitte by Eelco Rietsema, Maurits Malkus, Bauke Maarse on Behavioral Liquidity Risk Modeling mainly focused on the need and approach to develop behavioral models for liquidity risk and the challenges involved in liquidity stress testing (e.g. account for interactions between balance sheet items). As an illustrative case study, the speakers discussed in detail the liquidity risk involved in mortgage loans and touched upon the well known Northern Rock bank run example. The talk by Erik Vijlbrief and Pim Stohr from Zanders, compared two approaches for correlating the credit risk and interest rate risk in the banking book i.e. integrated vs. aggregated, with end use being mainly for regulatory capital calculation purposes. The speakers favored the integrated approach but indicated that the methodology is vulnerable to the parameter calibration accuracy. 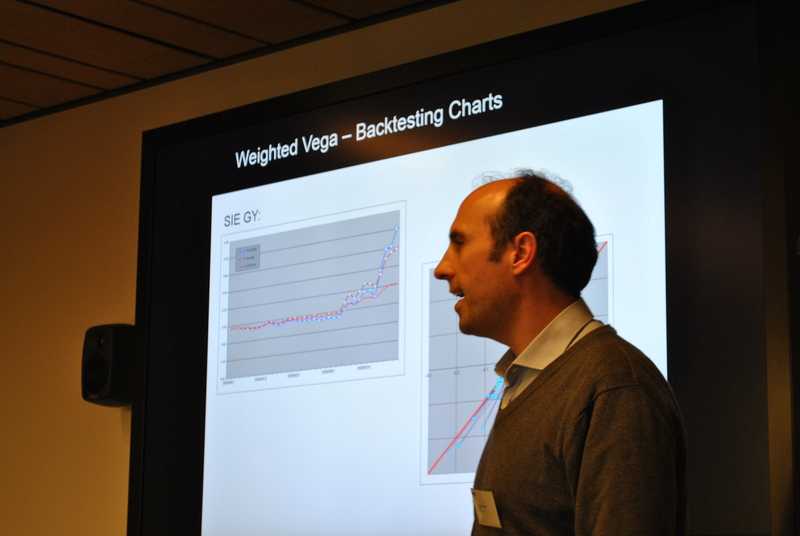 For the first time in a TopQuants event, we had a speaker from a market making trading company. Robert van Gulik (Optiver), provided highlights on the risk management framework within his firm and emphasized that Automated Trading Risk (ATR) will be an important source of risk for trading activities in the future. He cited many historical examples of trading losses that could be attributed to ATR incidents and also discussed some interesting ATR scenarios. 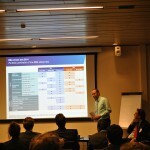 There were two presentations from KPMG, both of very different flavors. Jan Amoraal addressed a relatively offbeat topic, tracking customer behavior based on Wi-Fi signals. He presented highlights of the in-house Wi-Fi tracker employed in KPMG and also explained the theoretical underpinnings behind the software modeling/construction. As expected, the talk was followed by a round of interesting questions from the audience related to technical complications, legal issues, privacy of customers etc. 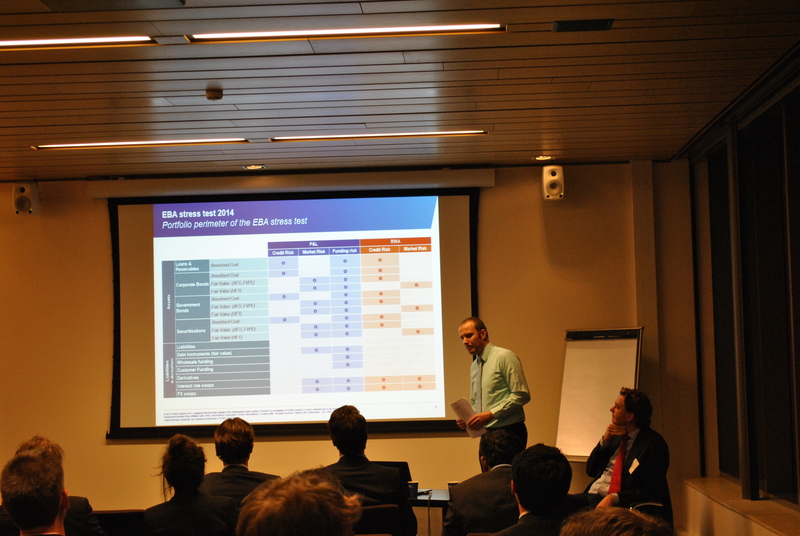 The talk by Paul Wessels and Erik Rood focused on the factual details of the European Banking Authority (EBA) stress test conducted in 2014. The speakers made interesting remarks on the effectiveness of the stress test and challenged some of the key assumptions of AQR (Asset Quality Review) like maintaining the stability of bank’s balance sheets, keeping the same business mix etc. 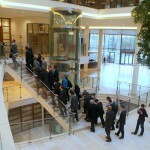 There were two talks that specifically focused on the valuation aspects of complex financial products. Jok Tang (VORtech) and Denys Semagin (ING Re) spoke on the modeling and computational challenges involved in pricing of variable annuities and highlighted the potential use of High Performance Computing (HPC) in tackling them. Dirk Scevenels (ING) highlighted the CRD IV requirement of applying Prudent Valuation standards to all positions measured at Fair Value and the absence of well defined technical standards from EBA for implementation of the same. Continuing further, he explained in detail, the concept of ‘Additional Value Adjustment’ which essentially accounts for the difference between prudent and fair valuations. 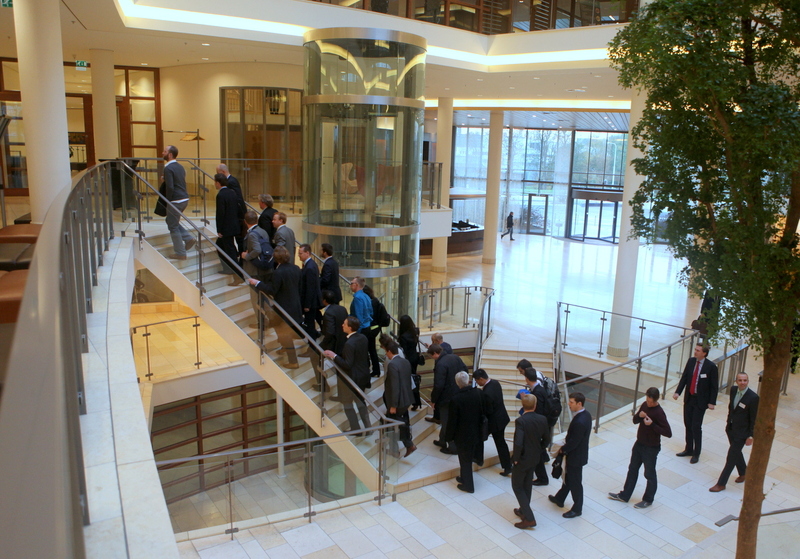 The talks by Jan Rosenzweig (FinCad) and Giampietro Carpentieri (Cardano) focused on the discounting of liabilities. Jan Rosenzweig, by the way our first overseas speaker, opinioned that the regulations (IFRS B, Solvency II) are not entirely coherent or rather sometimes contradictory on the ways to handle liability discounting which thereby makes it an open subject. His talk detailed on how liability discounting should be done and the Asset-Liability Management that results from it with Special Purpose Vehicles (SPVs) considered as a case study. Giampietro Carpentieri focused his talk on the hedging framework used for Libor benchmarked liabilities in the pre-OIS times and the changes required in the framework to account for the basis risk introduced due to OIS discounting. His conclusion was that, compared to other hedging assumptions, the basis risk due to OIS-LIBOR spread is relatively small. 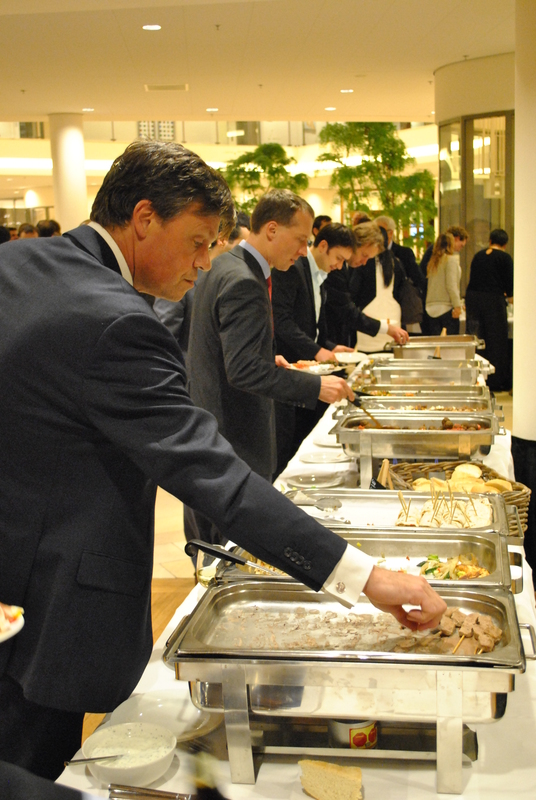 The lively event was concluded by drinks and snacks sponsored by the event host. 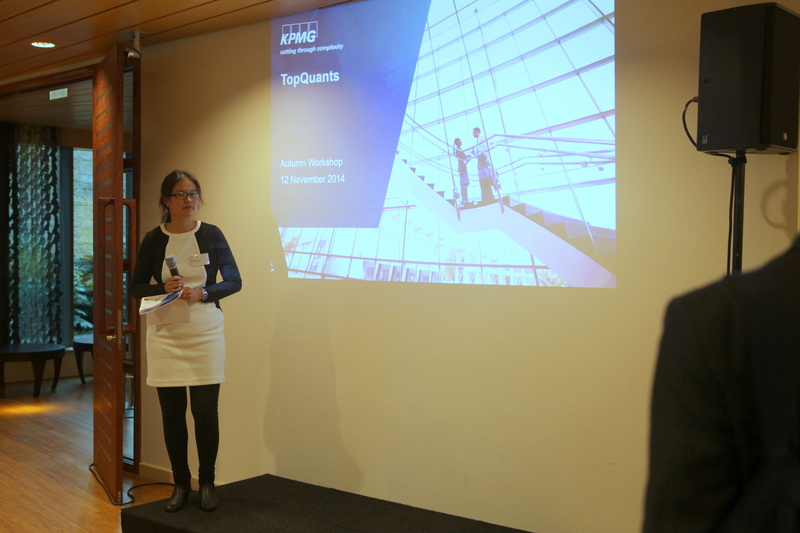 TopQuants are thankful to KPMG for sponsoring and hosting the event. 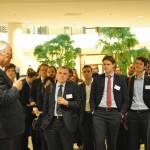 We appreciate all the efforts by the speakers and the quant audience for making this another successful TopQuants event. More information on this and future events will be published in the next TopQuants newsletter.